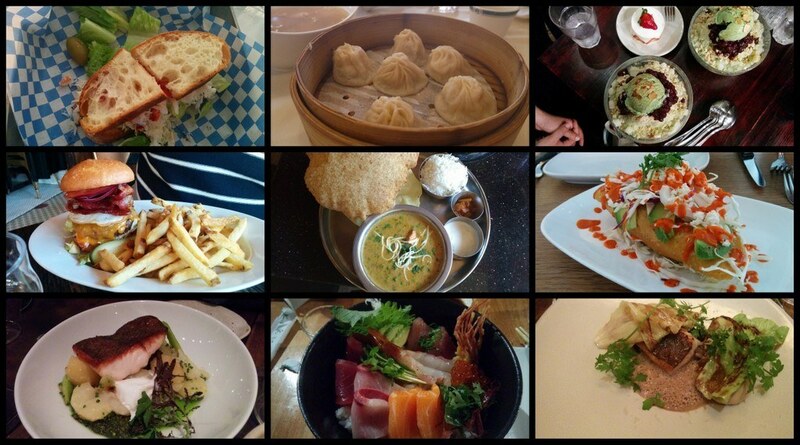 After living in SF for over 20 months now, and eating in over 160 restaurants (although some places would not be considered as an actual restaurant), I think it's about time to come up with a list of some of my favorite places to eat and snack. Keep in mind that SF is a very fast happening foodie place, which means we can never catch up with the "to-do list" that becomes longer and longer, and while writing this post I discovered that one of my favorite places closed its doors. Even so, feel free to use the comment section to recommend other entries to our list. The map below includes all the places indicated in this article (marked with a star) and many more notably favorite places, colored by category. Enjoy! Excellent local sensible restaurant, Californian cuisine but not to literal, female chef, hard to get a reservation, good value for money. Love the vibe here, sitting on the bar is fun, small dishes to share for the whole table works nicely here. Should Order: Bread goes here with everything from the famous Tartine bakery. I had an excellent Cod and a good appetizer with mushrooms. Beware of the dessert department - the pastry chef doesn't use any sugar so it's on the savory side, which can be good but can be disappointing at times. Small bar, intimate warm candle light vibe, good for a date or other romantic occasions. Food is spot on and not overcharged. Should Order: Small seasonal menu, nice entrees. The fish and pork dishes were excellent, there's bread and butter as well for no extra charge. The desserts were the weak point in our meal. Book ahead through the ticketing system in the website, better choose the later seating. Starting off in the reception area on the Mezzanine, then dinner on long communal tables. Food is mostly good, some experimental, a bit too much talking. A fancy place for a special occasion. Hard to get reservations so book ahead. You can choose 3,4 or 5 course dinner and select from the entire menu whatever you want. So much selection. Personal experience: 4 courses for each is way too much! We changed to 3 courses for one of us and split the cheese course and it was more than enough. Should Order:French and fusion cuisine. Seafood is really good but no misses here. Don't miss the cheese cart. The new addition to the Frances family. Generous sized dishes, mostly on the spot. We didn't have room for dessert. Should Order: Chicory Salad, Little Gems, Malfatti, Snapper. We didn't think the Pappardelle dish was as good as the rest. Love the idea behind this restaurant, a "dim sum cart" style place only with a creative New American tapas. If you can reserve a table here you definitely should. An exceptionally fun and tasty dinner with friends. The food is mostly good but the whole experience makes it special. Should Order: It's tempting to order too much but go for what looks good. Kung Pao was great. Really impressive, good value for money, cute little place, menu changes frequently, everything is inventive but exceptional. Get there soon before the crowds will discover this hidden gem. Should Order: Fixed 5 course menu, but we also added a cheese course and an oyster to begin with. Every dish was excellent. Should Order: Chicago style deep dish pizza, of course. As we are in California, go for the jalapeño and BBQ chicken pizza, addmittedly better than the one we had in Chicago. If you're planning on a (somewhat) cheaper burger - this is the place to go. Some would vouch for In&Out but for me Super Duper is way more superior. Messy and greasy but everyone loves it and for a good reason, it's delicious! Should Order: Double cheeseburger with bacon and (organic?) milkshake / soft serve. Ask for a RARE burger (don't worry it will be MR at best). Sleazy bar with heavenly meats. Super simple but delicious, cash only, great for late-night snake, after a movie in the AMC theater across the street. Love it or hate it, I loved it. Should Order: Brisket sandwich, gravy, home-made pickles. If you're in Oakland for some reason, in need for some comforting meal, love Mac & Cheese, and you're not Gluten-Free or Dairy-Free, this is a place for you. Menu is almost entirely made of different versions of this dish. Should Order: We tried and loved the Macximus, but there's so much more to discover here. Add breadcrumbs on top. Should Order: Seafood chowder was the best we've had, everything on the Happy hour menu (1$ oysters), crudo sampler, all the rest. Cutest little place in the Castro, there's always waiting here, no reservations, a bit expensive but good quality seafood. True San Francisco taste. Should Order: Their specialty is Cioppino which is a San Francisco signature dish of seafood stew, also try the steamed clams, crab melt, clam chowder with an excellent sourdough. Should Order: Good Sushi rolls and nigiri selection of the day. Baby octopus starter was disappointing, even though it's usually my favorite. After an extensive Ramen tasting all over the city, this place remains on top for me. Don't get creative here: get their signature dish and add extras if you're super hungry but thier Ramen is practically a whole meal in a bowl. The line can be vicious on the weekends, put your name in the list and go take a walk in Japantown while waiting. If the line is too long and you're too hungry, opt for the excellent Chinese in the same block called San Wang. Should Order: Yamadaya Ramen, the one with black garlic oil. Should Order: Definitely the Chirashi bowl. The nigiri and the more elaborate rolls are great as well. If you're looking for a really tasty Izakaya experience and willing to go all the way to Berkeley than definitely this is the place you should try. I was super impressed with how every dish was exceeding expectations. Just wonderful. Really good Dim Sum in the city. Only served at lunch (chinese food for dinner). Worth the wait. There's also Hong Kong Lounge 1, only few blocks away, which is also good but different. Should Order: Dim Sum for lunch: everything was good. don't miss the Shanghai dumplings (also called XLB) and coffee pork rib, baked pork buns. Come very hungry - this is the only All You Can Eat Korean BBQ in SF. You grill your own food here, which is really great, try with Korean beer or Soju. For the more expensive option (5 more $ each) you get to choose from 4 more meats. No need to be adding sides that costs extra, it comes with some salads, and it's more than enough. Should Order: Try the spicy pork belly, beef brisket, bulgogi and pork neck. I didn't like the chicken and the squid was chewy and too spicy even for us. Beware that the policy is that you have to eat what you ordered or pay extra, so try to ask for half portions of the meats if you're not sure you'll like it, or have place for it. Only open for lunch. There's a line but it's worth waiting. Best 4$ sandwiches!! The woman serving the food is mean but it's part of the authentic feeling. Should Order: There's not much to choose from but it's a tough choice. I love the pork combination (roasted pork with steamed pork and some pork pate) or just get the pork meatballs. Some people vouch for the chicken or tofu, because it's SF after all, but a real Banh Mi is all about pork. Small tip: "Fancy pork" is a type of bologna made of pork, it's part of the combination pork but if you don't perticularly love that, don't order the whole sandwich of it. Great vibe, Peruvian classics, cocktails look good but haven't tried, food is fresh and tasty. Place to go with friends to catch up, not too loud. Should Order: Empanada, Ceviche, Carnitas, Quesadilla. Everything we tried was delicious. From someone who ate a lot in Burma, and had a lot to complain about, this is far better. An hour waiting outside might be too much but this is a charming and warm place with delicious food. Should Order: Tea leave salad and Rainbow noodle salad are very good and have an extra interest: being mixed at the table. Some other dishes are Thai/Indian influenced but really good like Superstar curry and much more to discover. This South Indian Vegetarian place in the mission is really great. Every entree comes with several sauces and chutneys. Really good value for money and you come out super full but happy. The Sag Paneer isn't so heavy as usual so it's just a perfect dish to go for. Portions here are seriously huge, they put extra veggies in everything. Atmosphere is Chinese (oh well..) but one of the most enjoyable and better surprises in the spectrum for me. Really good for groups and families to share a big meal, yet it's not a big restaurant. Should Order: Green beans, Sweet and Sour Beef, Black Bean Noodles. Soups are pretty good. Should Order: BBQ pork Baked bun. A favorite food truck, recently opened a restaurant as well. Important to mention that if you like Karaoke, you can get the Chairman's food right into your Karaoke private room in the Pandora Karaoke (best to go on Happy Hour). Good combination of food+singing+cheap drinks. Should Order: Go for the baked bun or one baked and one steamed. Everything is tasty: I like the tofu, Omer like the chicken and the pork belly is good as well. Straight out of a 50's movie, this place is unbelievable. Don't just take a scoop of ice-cream here. Sit at the bar and have a wonderfully made ice-cream drink: Floats, lactarts, remedies, fountain drinks with Ice cream... They've got it. Should Order: There are too many good ones here. Caramel Apple, Cole st. Cola, Orange sicle... Watch the bartender make the drink, it's beautifully made. Caramelized honey ice cream is also a must try. Unique little coffee place. Hopefully you'll get a table to sit no more than 4 people. Korean style desserts and coffee. Should Order: Green tea shaved ice was surprisingly delicious and enough for 4 people. Other desserts look delicious as well. Cute little neighborhood Pie joint. They always have amazing looking pies with a little twist like their Green Chile Apple Pie with Walnut Streusel and Cheddar Crust. Surprisingly, you can ask to have your pie as a milkshake. Not sure why people do that. In rush hour you can stand in line here. Should Order: A slice of pie, the one I tried with berries was great but choosing is so hard. What's cool about this place is that they make every order of ice cream on the spot with liquid nitrogen. It's the perfect creamy texture and the ice cream is divine. This is also the reason why you can have one scoop of each flavor which is a bummer. You can opt for the "flight" which I never tried then you receive each scoop when it's done in 3 different cups. Weird. Should Order: Salted Caramel and tcho chocolate are always on the menu and are memorable but I always prefer something seasonal. Nectarines and Cream was superb. Inspired by International and Asian cuisine and her bringing up in Tel Aviv, Mashav Shelef leads the team of Le Couloir, tailoring private events, creating new and inspiring menus and making sure every event is one to remember. A graduate from Ferrandi - Paris and experienced in several Michelin starred restaurants. In 2013 created a Pop-up Secret Kitchen in Tel Aviv and now starting her way as a Personal Chef in San Francisco. She brings dedication, creativity and her undeniable passion for food together with a fresh approach to cooking derived from her scientific background.